Mario & Luigi: Paper Jam (known as Mario & Luigi: Paper Jam Bros. in PAL regions) is an Event Course in Super Mario Maker, created by Nintendo on December 2, 2015. It was created the day before Mario & Luigi: Paper Jam was released in Japan. Completing this course unlocks the Mario & Luigi: Paper Jam Mystery Mushroom costume. The level is based off of the Nintendo 3DS game Mario & Luigi: Paper Jam as there are a bunch of Mario Trio Mystery Mushroom costumes throughout the level, as well as a few others. In the middle of the level, there are two giant Bowsers inside a wall that shoot giant Fireballs at Mario as he climbs to the top to jump on a P Switch revealing a Super Star in order to defeat them. This could be a possible reference to the Papercraft Bowser battles fought in Mario & Luigi: Paper Jam. The level starts off with a bunch of Coins formed in the letters "M" and "L", which is an obvious reference to the Mario & Luigi series. Below the "L" is a ? Block containing the Luigi Mystery Mushroom costume. Next, there is a gap with a bunch of Goombas below. There is also another group of Coins that shape the letter "P", possibly referencing "Paper", or "Princess Peach". Next to the "P" shaped group of Coins is another group of Coins, this time shaping an arrow pointing to the right, over the gap with the Goombas. Then, there is a floating platform that leads across the gap of Goombas. Next there is a big row of Note Blocks that when Mario jumps on them, they pop out the 8-bit Mario as well as the 8-bit Luigi Mystery Mushroom costume. Shortly after, there are some more ? Blocks. One contains the Mario Trio Mystery Mushroom costume, as the other contains a Star. Then, there are a bunch of short gaps with more Goombas in them, this time with some Big Goombas stacked on top of the normal Goombas. After a few of the small gaps with the Goombas/Big Goombas, there is a stack of five Koopa Paratroopas floating up and down in the air. Next, there is a Warp Pipe with an arrow pointing in its direction above it. Next to the pipe are two more ? Blocks, one containing another Mario Trio costume, and the other containing another Star. Once Mario enters the Warp Pipe, he goes to an underground section of the level with two big Bowsers inside a wall shooting giant fireballs at Mario. There are several enemies trapped inside a long area bouncing on a row of Note Blocks. These enemies include more Goombas, Koopa Troopas, and Dry Bones. After passing underneath the row of the several enemies, there are some more ? Blocks heading upwards on top of the area the two big Bowsers are in. One of the ? Blocks contains another 8-bit Mario Mystery Mushroom costume. Once Mario reaches the top of the area with the two big Bowsers, he then hits a P Switch that reveals a Star, allowing Mario to become invincible and defeat the two Giant Bowsers. After that, Mario can now enter another Warp Pipe to the right, leading back above ground. 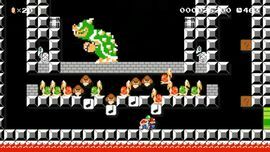 Once Mario is back above ground, there is a row of Brick Blocks that trap several Koopa Troopas underneath them. There are more Brick Blocks above that make out the words "MARIO AND", then there are Coins moving along a track that spell "LUIGI", completing the sentence to read: "MARIO AND LUIGI". Finally, there is a moving platform moving up and down to the left of the Goal Pole. Mario and Paper Mario have teamed up! (Oh yeah, and Luigi too.) Is any foe capable of withstanding their combined powers?! Thus begins the quirky, fun-filled story of Mario & Luigi: Paper Jam, and now you can play as that unbeatable trio right here in Super Mario Maker too! Mario & Ruīji RPG Pēpā Mario Mix The Japanese name for Mario & Luigi: Paper Jam, "Mario & Luigi RPG: Paper Mario Mix".